» Air cleaning, an issue? The habits of occupants and the building materials are – especially in existing buildings – difficult to change. Ventilation as a possibility to eliminate pollutants in indoor environments can to a certain extent help, but is requiring additional energy. Hence, photocatalytic materials that clean up the air are a big challenge and are considered as a good alternative to clean up the air indoors. 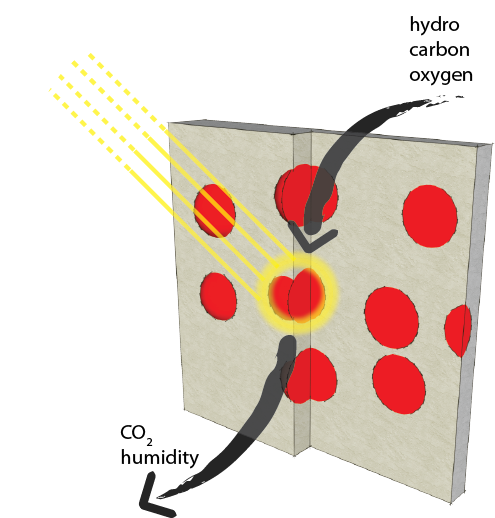 Photocatalysis is a natural phenomenon similar to photosynthesis. A substance called a photocatalyst uses natural or artificial light to stimulate a chemical reaction. With such a chemical reaction hazardous air pollutants like nitrous oxides, formaldehyde, benzene, VOCs etc. can be degraded and eliminated from the indoor atmosphere preventing them from accumulating in the air around us. The photocatalyst itself is not consumed by the reactions it stimulates. So, it has a long working life. The principle of photocatalysis. Using the lights energy to transform noxious substances into harmless compounds. image: Thomas Heine, University of Tübingen, Germany. » How can we use photocatalysis in construction products? Photocatalytic materials can for example be implemented in cements, binders (Italcementi, CTG, Italy) and glass (Fraunhofer IST). So, they can be used for a wide range of building products. This includes paints, mortars and precast elements – with which pavements, plasters and any type of horizontal or vertical structure and coating can be made. » What are the challenges? State of the art photocatalytic materials work best with ultraviolet light which is fine outdoors where they are exposed to sun, but less effective inside with artificial lighting and windows filtering the UV light. Clear-up focuses on the optimization of photocatalytic materials to be used under light conditions applied indoors. New materials are developed and tested in the lab as well as under indoor environmental conditions of temperature, humidity, illumination. » What kind of materials can do that? Nanocrystalline materials like TiO2 and ZnO show good photocatalytic activities to UV light. To make them work at visible light (wavelength>420 nm) nonmetals like C, S, N and B as well as Mn and other transition metals are used as dopants. Clear-up follows a bunch of different synthesis pathways for photocatalysts like powder preparation of doped TiO2 or film deposition of ZnO and Bi2O3. Synthesis is followed by analytical tests in laboratory as well as by testing of “wall scale” prototypes in different indoor environments.